﻿﻿Nature and wildlife are ever changing, so every trip out on the water is an opportunity to see something new, yet patterns emerge, yielding a little more understanding. 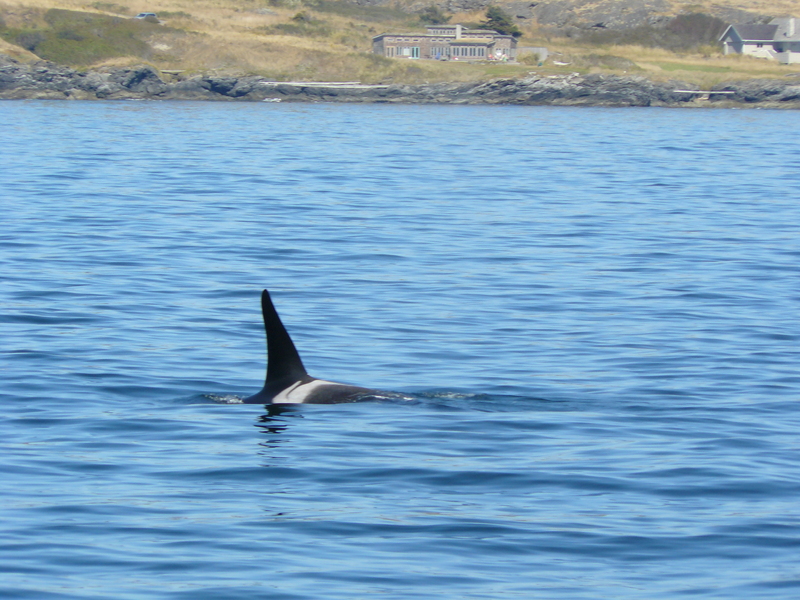 One of our trips took us to Canada, North Pender Island, where we found some J-Pod orcas, cruising right along the shore at Moat Point. There was a strong flooding tide they were using toward Active Pass. They showed how well their echolocation works to maneuver ships, ferries, boats, and docks, through some narrow areas! 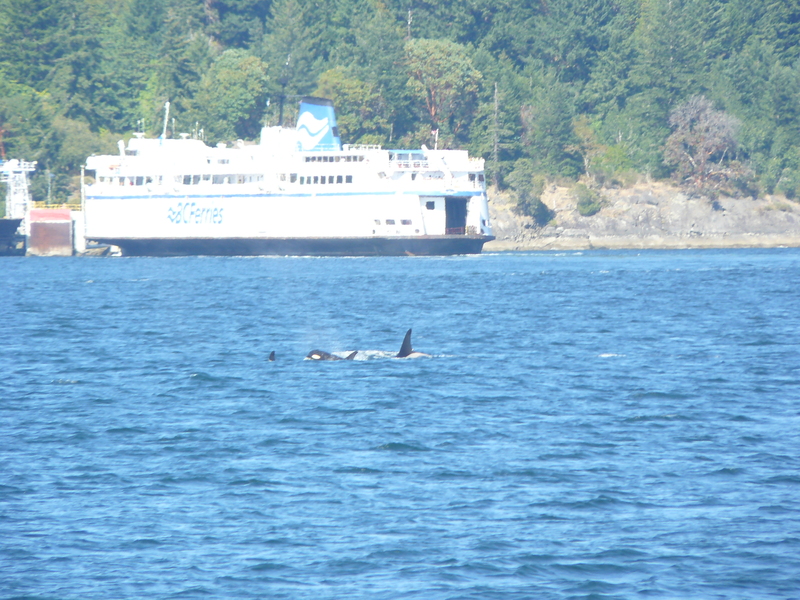 And to find fish, as killer whales from J and K Pods having been spending the last few days back and forth, sweeping the west side of San Juan Island. We have seen the salmon jumping too! Awed to see 19 year old J-27 Blackberry with 1 &1/2 year old cousin? J-45? very active breaching and flopping on his back, as though trying out a new move or view of his world! On another foggy day, K-21 Cappuccino and friends, seemed to rise from the mist right off of South Beach, for a few mystical moments going southeast then turning northwest, before being wrapped once more in the marine layer. The ‘westside waltz’ is familiar, but one is never sure; are they going to keep heading north, or turn back one more time, keeping us guessing as to the best route to see them! 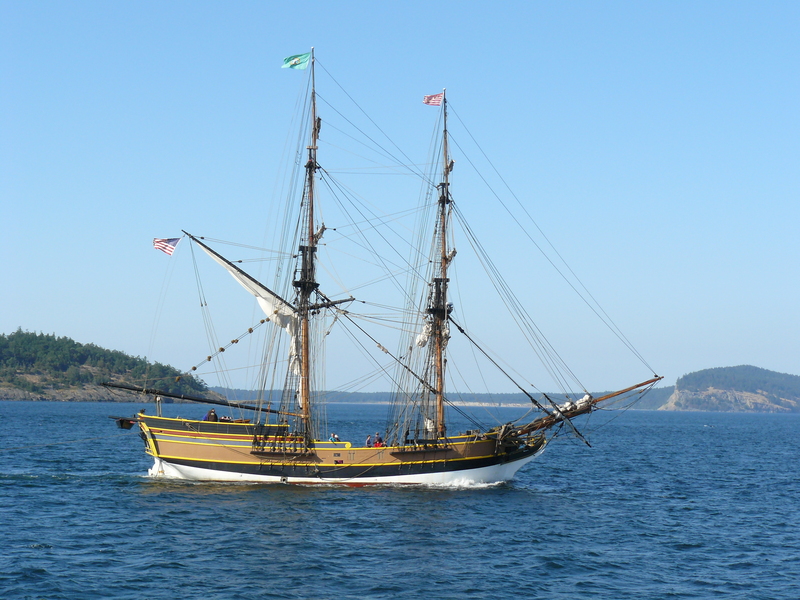 Today we enjoyed not only a warm sunny summer afternoon, also going all the way around San Juan Island, a circumnavigation, where many marine mammals showed themselves! Harbor Porpoise, Harbour Seals, Dall’s Porpoise, and a Minke Whale off of the northeast end of the Island, zigging and zagging its way northwest! Orcas; J’s and K’s foraging off of False Bay, headlining our tour! We think we saw J-14 with J-45. J-17 Princess Angeline and family with the 3 mom’s and 3 babies all close together, making rapid twists and turns, really looked regal! Were they teaching the calves how to hunt? J-30 Riptide is one big 15 year old- he’s already huge and still growing. K-21 Cappuccino and friends are back hanging out with the J’s. Many marine birds on the water too; Heermann’s Gulls migrating through, (not so common anymore?) Common Murres, and a Kingfisher perched atop a western hemlock. We probably missed an Eagle sighting with our attention on the rest of the Salish Sea wildlife!